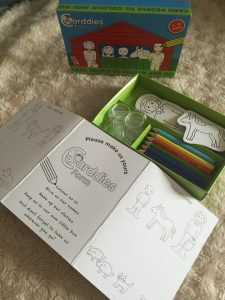 The girls love art and creativity so an activity kit from Carddies seemed perfect for them. As they are animal lovers, we decided to try out the Carddies Farm kit, available from Loubilou. Carddies, the Card People to Colour and Go, are very appealing sets of Card People who live in a box: you colour them in, give them names, make up their stories, and bring them to life. There is a collection of 12 sets: Carddies London, Sports, School, Fairies, Cavemen, Football, Ballet, Knights, Family One and Two, Farm and Nativity. 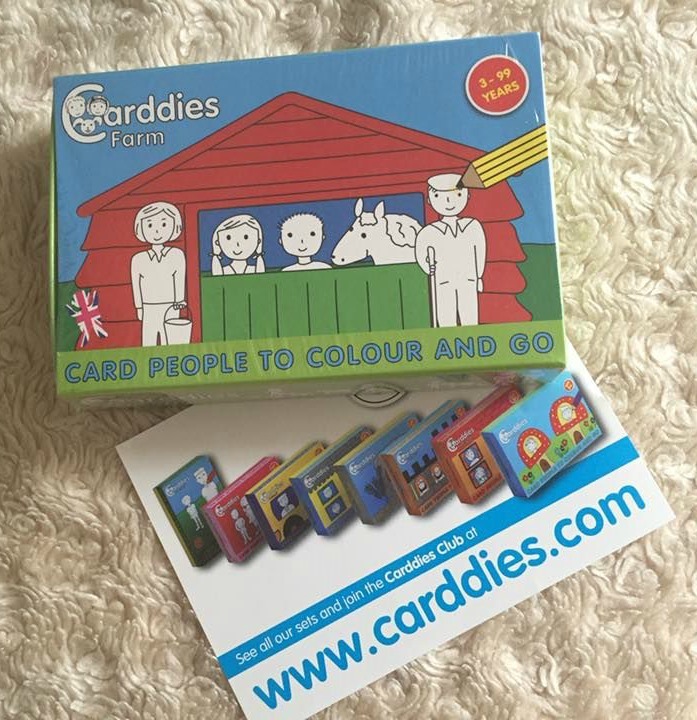 Carddies suits both girls and boys aged 3 to 10. Perfect for families on the go, each set includes 12 colouring pencils, 12 figures with stands and a backdrop, all included in a sliding box. The toy is self-contained, highly portable and made from premium card: perfect for keeping children amused on any journey or outing. The Carddies are 100% British designed, made and assembled using materials of the highest quality. The premium uncoated white card with which they are made provides a wonderful colouring surface. The British sourced colouring pencils are made in Indonesia using FSC certified wood. The pencil leads are of art pencil standard. Eco-friendly: The Carddies also have very strong environmental credentials, and FSC certified materials have been used throughout. I gave the Carddies set to Munchkin to colour as she enjoys colouring and Bee doesn’t seem keen on colouring at the moment; she lacks patience. What the girls liked about the set is that on the card with the ‘scene’, on the back you can name each of the Card People/Animals. So cue the arguments as to what all the card people should be called; those girls just cannot decide on anything together! One of the features of the Card People is that you can colour the back aswell, so it is not just a picture at the front of the card. Bee now loves playing with them and making up scenarios. These are great for imaginative play and even Munchkin has been joining in with her sister. The card itself is pretty sturdy and should last some time in even Bee’s destructive hands. The pencils are also of good quality; I have come across many that break pretty easily but these lasted and seemed strong. What I personally loved about the Carddies set is that they are eco friendly. 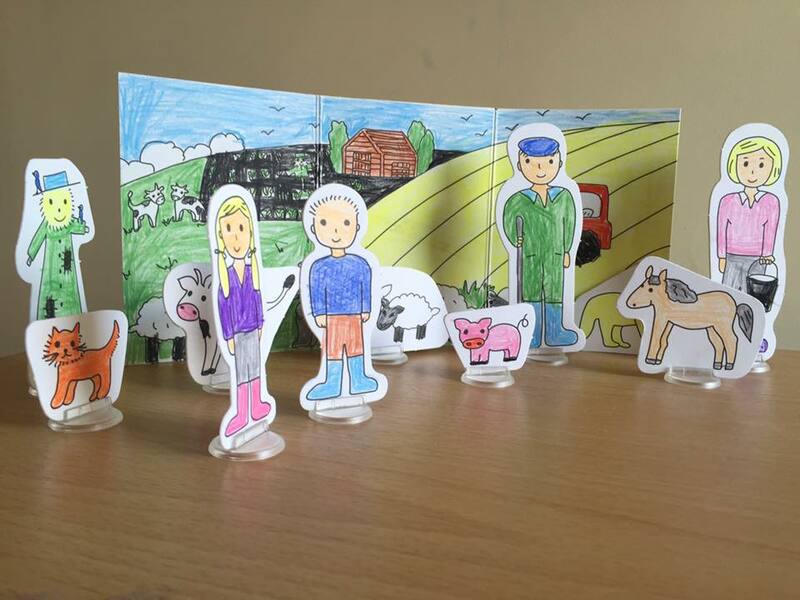 The Carddies Farm Set is priced at £8.99 and are suitable from age 3. We were sent a the Carddies Farm Set for the purposes of review. All thoughts and opinions are our own. I remember having a set like this when I was a child! 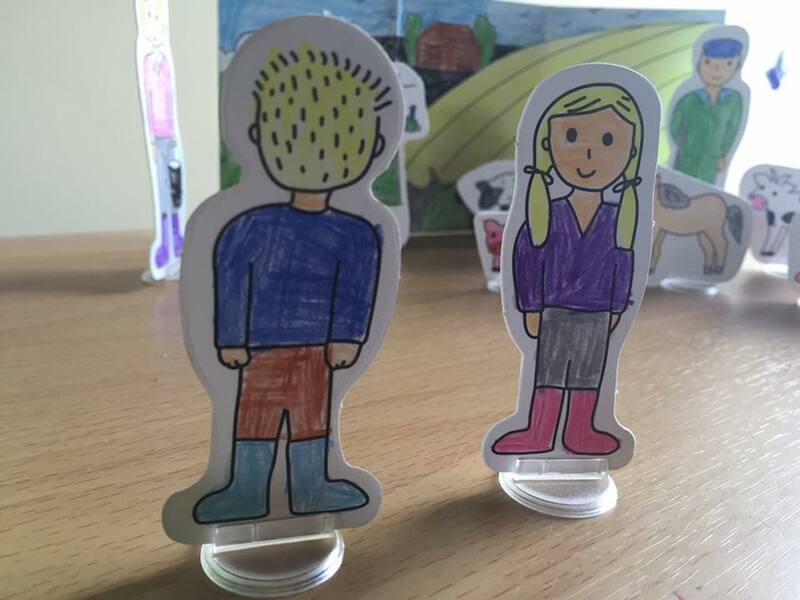 It was a fun way to spend an afternoon, colouring in the figures then role playing with them! JuggleMum, Nadine Hill recently posted…Primula… Paired! I can remember things like this when I was young, I absolutely loved colouring in and I remember you could buy cardboard books with pop out characters to colour and play with. I loved them so much, but I’ve not seen anything like it for a long time. I’m sure my kids would love these too. Anne recently posted…A Box Full of Excitement! – Boxcitement. Your girls sound just like my girls; they can’t decide on anything together either! This is quite cute for kids! Thanks for sharing! Oh we loved Carddies when mine were younger – great for imaginative play! Oh how fun is this! POD would love it, always enjoys packs she can colour and then play with afterwards. I don’t know Carddies either so we must investigate!